Here we have the latest output from Mexico’s Chuiy Bitios; inspired by and to coincide with the films of Loris Hantzis. I was deeply impressed with how the project had grown with his last output ‘Bradykardia’ displaying a high level of growth and maturity to Bitios’ work since the project’s inception. Opening in mid 80’s soundtrack fashion, we have the title track opener flowing into the ‘Glory Box Mix’ of ‘Dosificación’; featuring Noiz + Zilenth And Loris Hantzis. With one simplistic dance beat, whispered vocals and a multitude of simplistic electronics reek of atmosphere throughout a cavern of spatial awareness. One area where Epidemia has upped his game is with his noise production. Often in the past, production swamped the distorted beat so it lacked power; and I am happy to report that this is simply no longer the case. The Dark Ambient resonance of ‘Industrial Poisons’ provides another string to Epidemia’s bow, whilst ‘Dolichovespula’ grinds merrily along as a shuddering heartbeat; leaving the greatest surprise in the form of the arpeggio led ‘Cacofonía Del Mundo Exterior’. Here, the synths are prevalent in providing the main source of sound, layered across a mass of distortion. 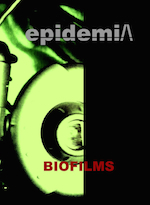 Variety is key to ‘Biofilms’ success as a body of work. Epidemia has taken the time to produce an album that is different to his last release, but no less engaging. I did prefer ‘Bradykardia’ due to its almost Post-Punk ethos (although that’s just down to a matter of personal taste); but together with this work, both albums set Bitios in good stead moving forward with this project, almost abandoning previous output’s limitations. Epidemia has been doing the rounds for some years now and Mexico’s Chuiy Bitios has always been deemed somewhat as an undercard to the distorted beat scene and maybe things will change somewhat with this latest release. Opening up with scientific samples reading like the portfolio to a university thesis, things kick off in a fashion not too dissimilar to Converter’s seminal ‘Blast Furnace’ and as more focus lays within production this time around, sounding more effective in the process. Track two capitalises on this with the layering of guitar noise providing an essential ambience for the electronic stimulus and earthly industrial sounds to hold weight. ‘Control y Bloqueo’ benefits from heavily leaning on Epidemia’s more electronic counterpart Chuibit; providing fresher perspectives to the work of this project that hasn’t been evident before. Along with the dramatically charged soundtrack that is ‘Extension Sistematica’, it makes me wish Epidemia had concentrated his efforts in this direction many a year ago. Eighties electronics seem to have really taken over Bitios’ mind-set as the title track is riddled with the influence, as much as this release is as a whole. Indeed ‘Bradykardia’ in it’s own right is probably the most engaging track on this release for me, with its simplistic formula providing a much-needed respite from previous works with its newfound vigour. 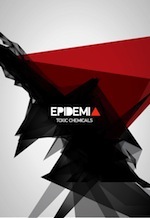 If anything, Epidemia has all but abandoned the power-noise scene and concentrated on letting the music do the talking. ‘Raid’ benefits from its rhythmical sections being evenly tempered with emphasis being squarely sat on the shoulder of nothing but the electronics with the beats taking a supporting role. 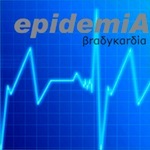 In the past my only criticism to Epidemia’s work has been that the production let the side down somewhat, however on this latest album that issue has been addressed and there is a wonderful simplicity to the approach of ‘Bradykardia’ that is heart-warming and a pleasure to listen to. Undoubtedly this is the best album released by this project thus far. Swirling electronics, glitch and string led ambience opens who this latest instalment from Mexico’s Epidemia throwing me off guard somewhat; I have become somewhat accustomed to all out assaults from this project in the past and this was a welcome introduction. Next track on the agenda is label mate Rudra Vena’s take on the title track which is an odd way to approach the concept, letting the mix introduce the original outlet; a solid interpretation non-the-less, but nothing on the title number. The title track itself is a wash of dirty 4-4 warm rhythms and paranoid electronics that gradually get overtaken in the mix with a scraping grind, either way the song is befitting of the track name and should be a welcome addition to any club set. Next up are two further remixes, one from Noize + Zilenth and Electrovot respectively; the former plays on the club nature of the track and adds a slight edge on crunch and noise, unsurprisingly whilst the latter adds and almost EBM edge and would further fill an alternate dance floor with its altogether hypnotic pace. Change is well on the agenda with ‘Control y Bloqueo’, shutting the pace down completely with feedback and piano chords that eventually come to a crashing halt with a barrage of power electronics, leading into some empty beats that sound ever so far away and crash into a somewhat tragic ending. ‘Reaparicion de Sintomas’ leans on a more German electro-industrial slant forgetting the distorted power noise that Epidemia has so often utilised in the past and is another welcome change, leading into Armenia’s take on the title track; Armenia have done many a mix for this artist and this is devoid of beats, concentrating on further schizoid electronics. All in all this is a welcoming balance of variation from previous affairs; my only niggle arises with the amount of remixes on show rather than full new tracks, giving this more of a mini album feel to it; still, this is an enjoyable romp and older fans of this artists work will appreciate this more.